Owning indoor plants is becoming increasingly popular, be it for wellness, aesthetics or function. However, not everyone has a "green thumb" and these plant owners sometimes struggle with finding the right plants for their home and taking care of said plants. We set out to identify the key pain points of houseplant ownership and create a solution to help inexperienced plant owners buy/maintain their plants. Our final solution Blossom, is a smart device that allows the user to monitor their plant's status in real time. Using ambient notification or its accompanying app, Blossom notifies the user when any kind of care is needed (watering reminders, soil change, repotting, etc). How might we help inexperienced plant owners, buy and maintain house plants? To gain insight into indoor plants and their care, we did background research on the demographics of plant owners and the important factors to consider when caring/buying a plant. Through our research we found that a high percentage of new plant owners are between the age of 18-34 (5/6 million new American gardeners in 2016) and that the popularity of urban gardens is growing. With this research we established our initial primary user profile. We used affinity mapping to analyze our qualitative data and identified a few key themes. After analyzing our data through affinity mapping and identifying our key themes, we completed a walk the wall exercise to generate design ideas. 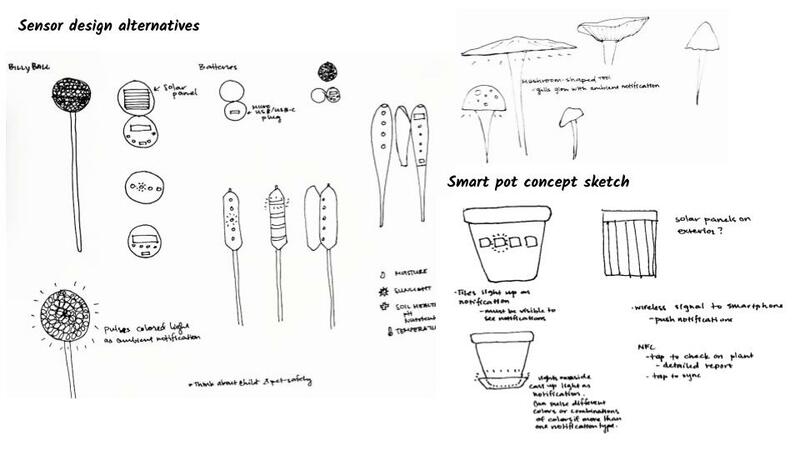 These design ideas were then grouped into 8 design concepts which were then scored on feasibility, relevance and creativity. The top 3 concepts were further explored. An AR app that helps users who are unsure about their ability to visualize a plant in a certain location, get an idea about the kind of care it might need and how easy or difficult it may be to maintain. An in store kiosk that suggest plants based on user criteria and also shares plant details, care information and placement information. A smart device that tracks and monitors the plant and notifies the user through ambient notification and an app when care is needed. 94.8% of participant said they may/may not consider or would definitely consider buying an additional device for their plant but that if they did, they were only willing to spend $1-$10 per device. Concept 3 aka Blossom is a smart sensor with an associated mobile application. The sensor is to be inserted into a planter and senses soil conditions (moisture and nutrient levels) as well as environmental conditions (amount of light and ambient temperature). These factors were chosen because of their importance in keeping a plant healthy and thriving. When conditions fall outside of a certain range, the user receives a notification via the app and through ambient light notifications on the sensor itself. The device emits a light, with the color of the light indicating the type of intervention needed. The user can then go through the app to get more detailed information. The form of the device was modeled after Pycnosorus globosus, or billy ball, a type of daisy with a tall thin stalk and spherical head covered in yellow flowers. This form was chosen to keep within an organic aesthetic that would be visually unobtrusive to most plant types but still have some visual interest. The device has a stem with sensors for the soil on it and a textured spherical head with the light meter and thermometer. There’s also a Bluetooth transmitter housed within the head to communicate with the user’s mobile phone when they are within a certain proximity. Most of the interactions with the device are done through the app. 1. Setup - during setup, Blossom blinks a white light to show that bluetooth is on followed by a long steady light once connected. After setup. Blossom only lights up to communicate to the user. Normal state if off. 3. Issue Notification - For other less frequent issues, blossom uses a red light to indicate to the user that there is something wrong with the plant. To get specific details on whats wrong ( temperature, soil, light etc. ), the user can opens the Blossom app. User launches app and goes through the first run experience. Then, they follow a few steps to link their Blossom to their plant. User can either enter the plant name (if they know it) or the app can auto detect the plant using a picture. Upon identification, user then acknowledges if plant is properly identified or not and then links their Blossom. When an issue arises, the user gets a notification on their phone. Once clicked, they are directed to the details page of the relevant plant. There they can view specific details on the issue at hand ( in this case, the plant needs water) and mark the issue as addressed.